Spurred on by Kristin’s request for some Australian novels, I’ve recently been re-reading some of the novels on my Australian Reading List (and the additions in the comments). So far I’ve read A Town Like Alice, They’re a Weird Mob, Harland’s Half Acre and The True History of the Kelly Gang (can’t believe I read about Ned Kelly!). What’s particularly struck me is how strange it seems to read stories set in a geographical background that is familiar. Somehow reading “foreign” novels is normal, whereas a story set in my Australian hometown seems quite out of the ordinary. Perhaps more than anything it tells you of the cultural dysjunction with which we have traditionally lived. The other day I picked up Foreign Correspondence by award-winning author and journalist/foreign correspondent, Geraldine Brooks. Geraldine grew up in Sydney in the 1960s and while there’s about a five year time difference from my own experience, so much of what she talks about is familiar. Her experience of living in Sydney’s western suburbs is so much starker than my own in Brisbane although the tightness of the community and a sense of its potential claustrophobia is similar. Much of Australia’s cultural attitudes of the 1960s come through in her writing, some overtly and other aspects more indirectly. She speaks too of the big events and issues of the era including the Vietnam war and the impact of Gough Whitlam’s election as Prime Minister. Her health in childhood affected her schooling and how she interacted with others. She speaks very much as one who couldn’t wait to leave Australia and see what the big wide world had to offer and until she reached adulthood, she used pen pals as her gateway to the world. Nearly 30 years later she wonders what happened to those “foreign correspondents”. She traces them in the US, Middle East and France ultimately concluding that in fact her early life was not quite as circumscribed as she thought and that despite her many successes, at the time of writing this story she gained satisfaction from living a life not unlike the village-based life of her former French pen friend. 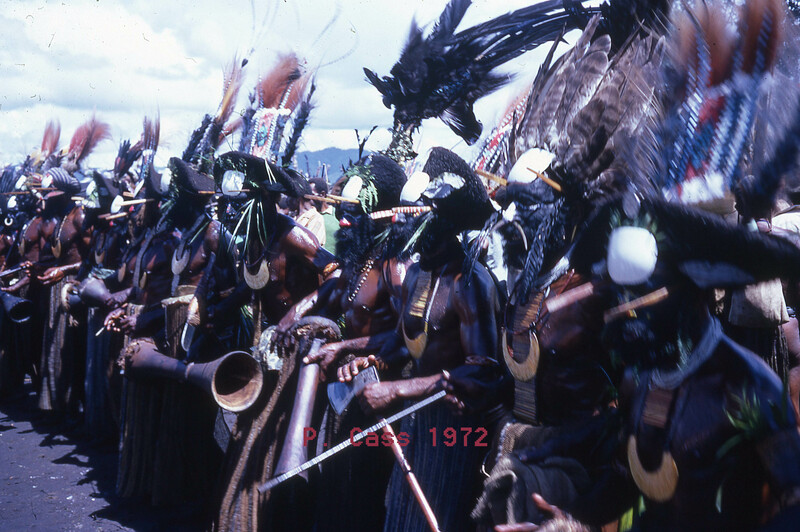 Warriors at the Highlands Show, Goroka, PNG 1972. Reading a book like this, which fits closely with one’s own experiences, raises questions about life differences. My first thought was that while I had always desperately wanted to travel, I never expected or wanted to live the life of an expatriate. Only one or two of our friends from university made the sea voyage to England to work, perhaps because many of us met our life partners at uni. It’s a paradox that when thinking of living “overseas” and the life of an expatriate, my focus remains on the UK. This is ironic because for nearly a decade I was an expatriate in Papua New Guinea, a country which was vastly different to anything that would have been experienced in Europe, despite its dominant Australian overlay. London would probably have been less of a shock. With cheaper and faster flights world-wide it’s now common for our children’s generation to live and work overseas. Many parents (including us) have one or more children living at vast distances from them. Many Australian young adults make the pilgrimage to live and work around the world. Most of them probably return eventually, but others live elsewhere for the rest of their lives: we are a peripatetic nation. There is a book by Nikki Gemmell called “Why you are Australian”, written to her children who had been growing up in London until the family made the reverse migration to Australia. Although some of it seems over the top or idealised, she does evoke so much about being Australian. Why am I Australian? Apart from those five generations of Queenslanders who’ve gone before me, the reasons are based in country almost in the indigenous sense. When you return from overseas, the first thing that hits you is the light. The brightness of the colours almost hurts your eyes after the grey skies of northern countries. Perhaps that’s why the birds are so often colourful too –they have to compete. The sheer expanse of the sky and its vivid blue on its many clear days. The ocean of stars in the sky at night, spanned by the white haze of the Milky Way, more startling in the bush or over the desert. The Southern Cross tracking its way across the night sky spinning on its southerly axis. The red desert colour, the roar of the ocean waves breaking on long stretches of white sand or the red beachside cliffs of north-western Australia. 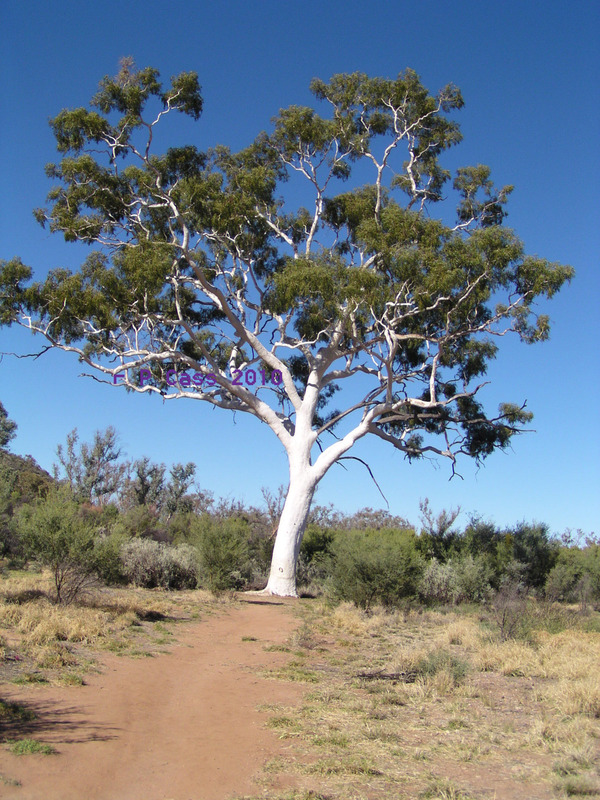 The starkness of our bush, and what foreigners see as its emptiness and isolation. Storm clouds over the Tropical north in the Wet Season, all sound and drama. The geological patterns stretching from shore to shore, across thousands of kilometres so that the country around Mt Isa will remind you of the Red Centre or parts of Western Australia. The ancient rock formations and the centuries-old ghost gums. For so long we saw ourselves as a young country when in reality we’re as old as time, deceived by the absence of buildings to declare man’s presence yet in caves around the country there’s ancient artgoing back thousands of years. 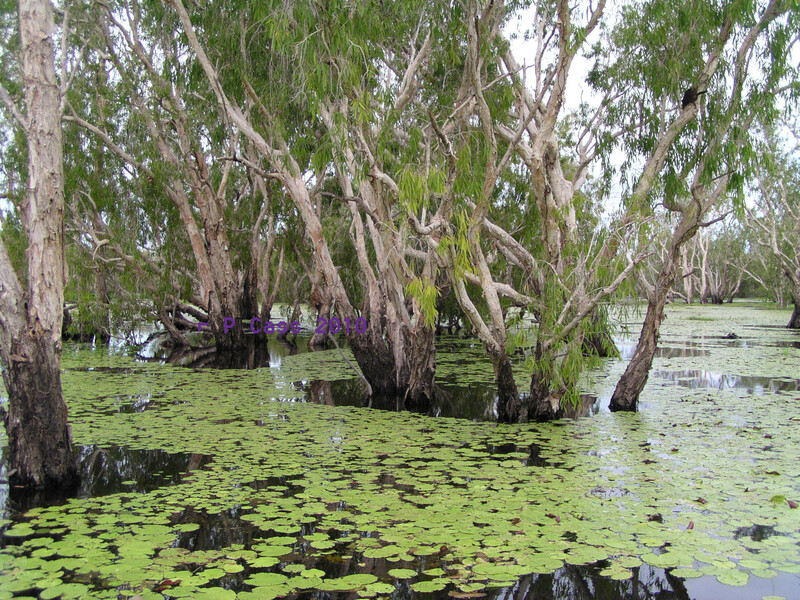 Floodplains, billabongs and aged melaleucas in the Wet. I remember once a distant Irish cousin asking me if I was Australian or Irish. It was a genuine question but I confess I was both bewildered and astonished. For me it was a “no brainer”, I’m an Aussie through and through, much as I love visiting my ancestral places. You won’t (usually) find me beating the patriotic drum, flying a flag at every turn sets my teeth on edge, and those stickers saying “if you don’t love it, leave” make me want to scream (do they never criticise someone they love? I doubt it). But yes, I’m an Australian to my core. Funny how a book can make you want to declare your sense of belonging. I wrote this story a week ago but hadn’t posted it. Last night soon after it was uploaded I was reading recent posts by a young Aussie blogger I follow at A Big Life. Living in Bavaria she talks about being caught between two countries and the pull of home – the expatriate’s dilemma. Two of her reflective posts are here and here. You can see other photos of the Top End of Australia on my Tropical Territory blog which shows just how beautiful this part of the country can be. If you’ve been reading my blog for a while you’ll have seen some of the magnificent east coast country. This entry was posted in Australia, Books, Family History and tagged Australia, Foreign Correspondence, penpals by cassmob. Bookmark the permalink. Very thought provoking post. I see similarities and differences between me here in the US, in America and you there in Australia. Needs more thought to say what I want to. I look forward to hearing what your reflective thoughts are Kristin…I know it will be interesting and thought provoking. This post is of course a very personal perspective rather than an absolute position. I look forward to hearing what your reflective thoughts are Kristin…I know it will be interesting and thought provoking. This post is of course a very personal perspective from my own experience, not at all presuming that it’s “right” or “wrong” or that I speak for anyone else in Australia. A couple of years ago, a young man from South Africa answered my posting for some yard help. He was working on his MA in business, but needed some extra cash as his girl friend was coming to Ashland for Christmas. The couple was delightful, but I was surprised how easily and often they traveled to Australia – and South Africa — and back to Ashland. Young people of the world wide community. Yes the world is a smaller place these days and the young people are at the forefront of the migration (temporary or otherwise). Australia is full of Irish migrants at present due to their terrible economic conditions right now. I think too that southern hemisphere people are also prone to travel more, or perhaps that’s my perception. Everything is far for us so we regard it all as no big deal. I remember once an Irish friend being surprised that I was “popping over” from Ireland on holidays to Switzerland as if this was remarkable…it was a shorter flight by far than any we do now from Darwin to the east coast. A different perspective…like travelling from Oregon to New York perhaps. Your post reminded me of something I read years ago about Australia – it may have been one of Clive James’ memoirs – mentioning this sense of dislocation, that people who had been born and raised in Australia still saw England as their ‘true’ home. I suppose it must be a feature of being a community that was originally transplanted so far away and into a place that was so utterly unlike England that Aussies held on to their self-perceived identity as ‘English’ far longer and more strongly than expat communities in less extreme environments. Thought-provoking post, thanks! Agreed this is a sentiment that’s been expressed. I think that few if any of my generation would regard Britain as home nor did my parents. But perhaps before that. My own family being heavily Irish and Scottish was perhaps less focused on “England” as home….my grandfather for example was very pro independence for Ireland so in that branch there was not a chance of England as home. For many decades that affiliation with England carried through to radio announcers’ voices etc, the news at the movie theatre was British often and God Save the Queen was played as our national anthem. It probably also played a significant part in why Australians rushed to join WWI. Less so in WWII and both of those impacted both on loyalty and a greater sense of Australian identity in its own right. How all these influences have come together to shape our sense of being Australian is an intriguing one. The joys of being a nation of “mongrels” with hybrid nationalities of origin. Coming to this theme rather late – where has the last few weeks gone? By coincidence I have been working on something bookish – watch the AR blog over the next day or so and you will read about the project. 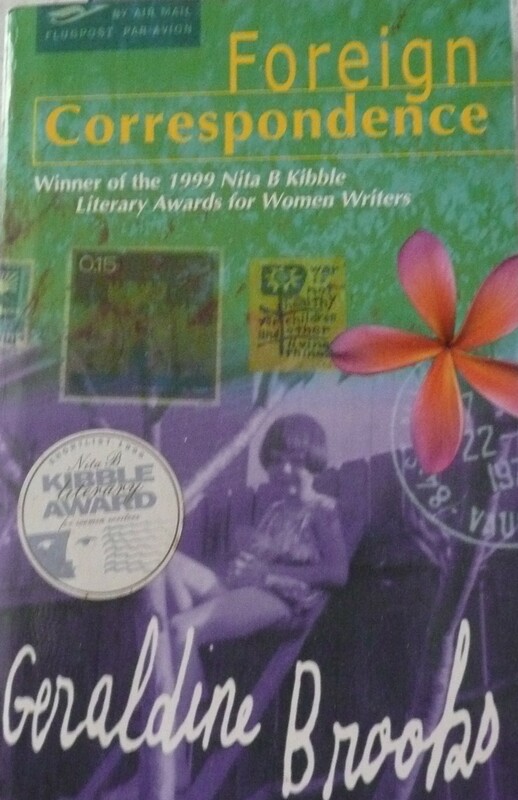 The book I had sitting on the desk next to me as I was reading your blog with a cuppa was Foreign Correspondent by Geraldine Brooks. I have read this before and think it is time for a re-read. Your cousin’s question reminds me of a former boss, who asked me as I was having a rant over staff poor performance if I was thinking and reacting with the Italian bit of my brain or the English bit? I remember stopping to consider the question and I did give an answer. I was born in England to an English Mother and Italian Father. I have never lived in Italy. Yet, absolutely I was responding with the Italian bit of my brain. When I am in a room of English people I am sometimes feel very Italian and yet when with a group of Italians I suddenly feel very Anglo! There is so much more considerations to be given to this, perhaps a further response when I have reflected more fully. Thanks for joining in on this topic Julie. What an amazing coincidence that you had the book on your desk! I was “amused” by your rant over poor staff performance -I can do that entirely with my Anglo brain! It’s interesting though that the different inheritances makes a difference to how you see things. I’m looking forward to your upcoming topic and also further comments on this when you’ve had reflection time. I read ‘Foreign Correspondence’ and found it interesting. I grew up in Detroit and except for several Chinese immigrants in elementary school did not have anybody speaking another language in my childhood. For several years, while the community was changing, the same elementary school was majority Jewish. After that, for the whole time I lived in Detroit, the community was African American. I never attended religious school so didn’t have that to deal with. When I was growing up in Detroit we walked and rode our bikes everywhere and were not worried about crime until drugs hit in the late 1960s. I did want to travel and even live somewhere else. The only place, I’ve been outside of trips across the border to visit relatives in Canada, was 7 weeks in Norway when I was 35. I never had pen pals growing up, although one of my daughters had a bunch at one point. Now, through the internet, I’m in touch with people all over the place. I’m glad you enjoyed that book Kristin. It’s funny but I never imagined Detroit communities being so homogenous within each. See how much we learn from our virtual penpals! Did you enjoy Norway? We dashed through years ago on a whirlwind train ride to see fjords but don’t have any real sense of the country. I enjoyed my visit to Norway very much. I was able to go because of my interest in Sigrid Undset and her book ‘Kristin Lavransdatter’, my namesake. I will have to blog about it. Yes, Detroit had very specific communities. Aside from being one of the most segregated by race cities there were Polish communities, Arab communities, Jewish communities, migrants from the south communities and African American communities. There was some mixture, but not much. How interesting that Detroit’s suburbs had such distinct communities separate from each other. I guess that happened in Brisbane too to some extent so that some places were known as Italian or Greek suburbs but they were still intermingled with others to some extent. There was a specific Polish church but the people were scattered through the suburbs. The racial segregation sounds more familiar in regard to Detroit. Has all this changed over the years in Detroit? Detroit at this point is in pretty bad shape. It’s still pretty racially segregated, not legally. Some of the older communities have changed over the years from one group to another. Hamtramck, a city that is in the middle of Detroit, used to be 90 % Polish. Now it’s majority South Asian and Arab, with a small number of Poles remaining. Dearborn, which borders Detroit, is at least 40% Arab. Detroit itself is 88% African American, 12 % white and the rest other. I just looked these up online, I don’t have the make up just in my head. There is a large Latino population in SW Detroit too. On my visits to Detroit and from friends and family that still live there, it’s still mostly racially segregated. You could live in the areas my family/friends live in and rarely see a white person outside of a store owner or worker. If I write about Norway it will be about travel for sure, in addition to how I happened to go in the first place. Thanks for letting me know more about this Kristin. I guess that swap over from one new immigrant group to the latest is common around the world but Detroit seems to have taken it to extremes. There’d be parts of our big cities, like Sydney, that would have some of those traits but not to this extent I suspect. In some respects this is perhaps why people don’t empathise with other groups -they have no exposure to them. Fascinating to learn about the different lifestyles. Look forward to hearing about the how and why re Norway as well as the travel! Very interesting post Pauleen and gives much food for thought which I’ll reflect on for quite some time. As a born and bred 5th generation (European) South Australian my life’s experiences, and understandings, differ hugely from those on the Eastern Seaboard. Then if we throw in social classes, cultural background etc… it becomes a whole different “kettle of fish”. Thanks for the sharing. I’d be interested in hearing your perspective some time Catherine. It’s easy to forget just how different things were in SA over the years.